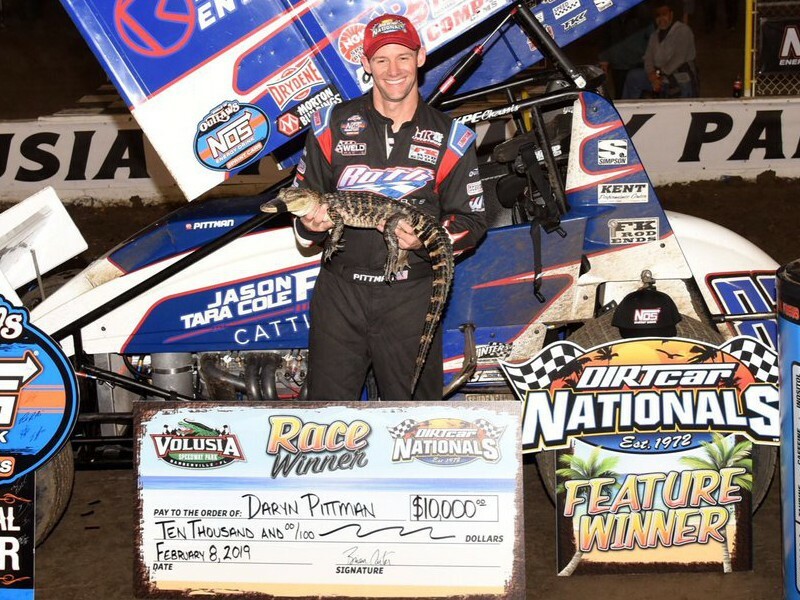 Daryn Pittman, seen here from the previous night's win, scored his second straight DIRTcar Nationals victory for the World of Outlaws NOS Sprint Car Series on Saturday night at Volusia Speedway Park. BARBERVILLE, Fla. - Daryn Pittman and Christopher Bell waged an epic back-and-forth battle Saturday night at Volusia Speedway Park’s DIRTcar Nationals. Pittman made his final charge with two to go for his second consecutive World of Outlaws NOS Energy Drink Sprint Car Series victory to start the season at the Barberville, Florida raceway. Bell, a NASCAR Xfinity Series driver and three-time Chili Bowl winner, led the first 18 laps before Pittman slid to the front on lap 19. Bell dove back in front a lap, as the two two exchanged the lead on laps 26 and 27. Pittman regained the lead on lap 28 and held off Bell to the checkered flag to complete the second caution-free 30-lap feature in a row. Pittman’s victory on Saturday night was the 83rd of his series career. Donny Schatz finished third, followed by Brad Sweet in fourth and Brian Brown in fifth. In DIRTcar UMP Modifieds action, the first of two nights of qualifying races for Monday’s Gator Championship event wound up falling to rain with heat races completed shortly after the World of Outlaws feature was completed. Two Last Chance Showdowns and the feature will be run on Monday ahead of the regularly scheduled races. The DIRTcar Nationals continues Sunday with the final night of World of Outlaws NOS Energy Drink Sprint Car Series action at Volusia Speeway. For more information, visit DIRTcarNationals.com.